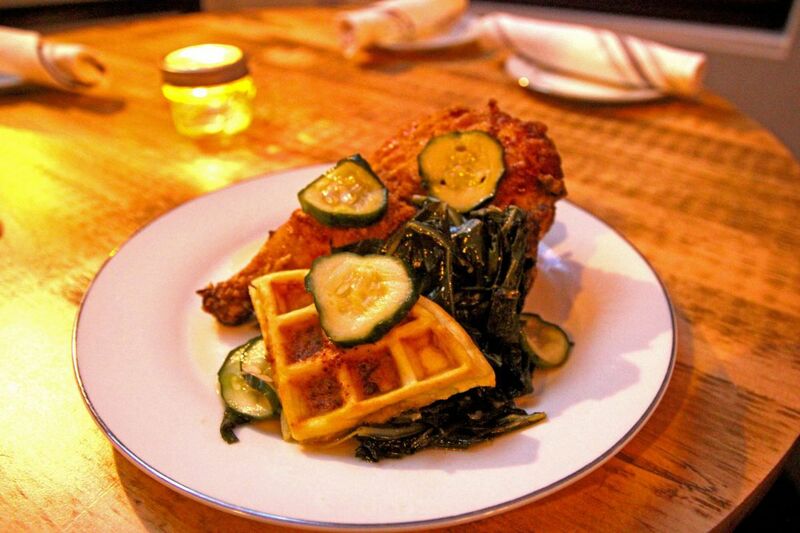 Fried chicken and waffle at Gin & Pop, 1839 Poplar St.
Two years ago, Kris Kwiatkowski, visiting friends in Francisville, noticed a corner bar called Flying Carpet at the multipronged intersection of 19th, Poplar, and Ginnodo Streets. Word got back to him and his brother, Tom, that it was available. They went all in, buying the building and joining what seems to be a building frenzy in the neighborhood. Friday, Oct. 6 is the first day of Gin & Pop (1839 Poplar St.), the ownership debut of both men. Tom's bar background includes Scarpetta and MilkBoy. Kris, a former pro drummer, comes from the finance side. They're aiming for locals with high-top seating in the vaguely industrial, triangle-shape dining room, which faces an expansive, well-stocked bar with 10 beers on tap, a collection of bottles and cans, and 11 cocktails. Mini-lobster roll at Gin & Pop, 1839 Poplar St.
Their secret weapon is chef Josh Noh (ex-Sampan, Matyson) in the kitchen, executing a collection of pub food, including generously topped short-rib poutine (topped with a fried egg), tuna crudo, sweet-and-juicy fried chicken atop savory herbed-ricotta waffles, a burger, and mini-lobster rolls (which at $6 are a steal). Hours are 4 p.m. to midnight Monday, Wednesday, and Thursday, 4 p.m. to 2 a.m. Friday and Saturday, and 11:30 a.m. to midnight Sunday. It's closed Tuesday. Gin & Pop, 1839 Poplar St.